If a specific size of flox corner is desirable, an approximate dimension may be given as shown. Don’t make your flox corners square. The extra flox only adds weight, not strength. Peel ply is a layer of 2.7 oz. dacron fabric which is layed up over a fiberglass layup while the fiberglass is still wet, and is later removed oy lifting an edge and “peeling” it off. 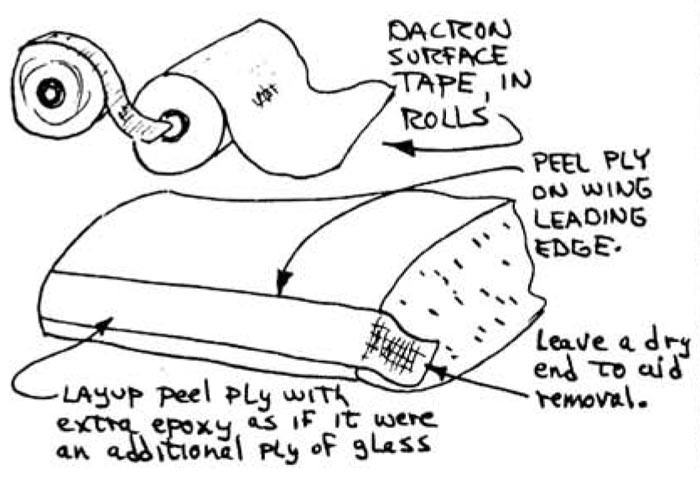 The most convienient form of dacron to use is “surface tapes”, normally used in covering fabric aircraft. These are available in rolls. You will need at least one roll, 2" wide. (1) Peel ply any area that will later be structurally attached to another fiberglass layup. Once the dacron is peeled off the surface is ready for another layup, without sanding. If you do not use peel ply you will have to sand the surface completely dull (no shiny spots). This sanding is hard, itchy work and ruins the strength of the outer ply of fiberglass. (2) The second use for peel ply is to transition the ares where the top ply of a layup terminates on the fiberglass surface. Refer to the adjacent sketches. If the top ply edge is laid up bare it results in a rough edge that can delaminate if a little dry. Sanding the rough edge is hard, itchy work and usually results in damaging the adjacent surface. 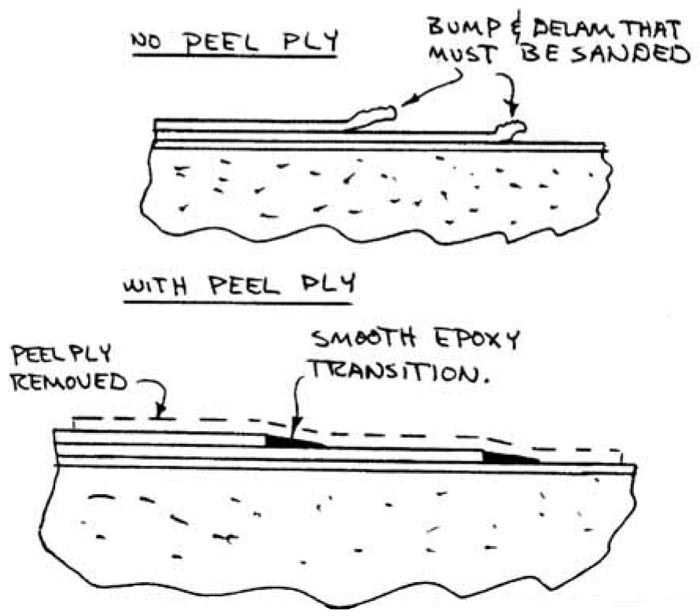 If the edge is overlaid with s strip of dacron during the layup (lay on the dacron & wet out by stippling or squeegeeing) it will make the edge lay down flat and will form a wedge of epoxy to smoothly transition the edge. After cure, peel off the dacron. The result is a beautifully transitioned smooth edge with no delamination tendency. Use this method in all pieces where a cloth edge terminates on the surface. Note that to peel ply the trailing edge overlap ares, the peel ply is the First ply reds to the foam core. Lay a strip ot dacron down on the overlap notch & secure it with tacks or staples so it dosen’t sove when you leyup the skin. it you work with epoxy on your bare skin, you can develop an allergy to it. This “sensitization” to epoxy is an unpleasant experience and is to be avoided. You generally have to get epoxy on your unprotected skin to become sensitized. If you use a protective barrier skin cream like Ply No.9 (available from Quickie distributors) or disposable plastic medical examination gloves (also available from Quickie distributors) the allergy can be avoided. The barrier skin cream also allows you to clean up with soap and water after a layup. The RA epoxy systems are low toxicity (SPI=2). However, msny people (about 5 to 7 percent) are sensitive to epoxy to a grest extent and thus will find it impossible to build their airplane without extensive skin rash, facial swelling, etc. These people can get some help by using doctor prescriued anti-allergy medicines and/or by using elaborate masks/multi—gloves, etc, to reduce exposure, however in many cases the allergy is sufficiently strong to preclude their ability to make layups. Remember to Always use skin protection, never let epoxy come in contact with bare skin, even if you have no reaction to it. Sensitivity is accumulative, such that you may later develop an allergy unless you protect your skin. Sanding or grinding fiberglass and foams creates dust that can be harmful to your lungs. Use a dust respirator mask for these operations. Disposable dust masks are availaole at most paint stores. Mix and work with your epoxy in a ventilated area. Some expoy/hardener systems may irritate your eyes (like cutting onions) in a poorly ventilated work area. If your chop is not ventilated, set up a small fan to move a small flow of air in or out. Do NOT hotwire urethane! Drilling through cured glass tends to tear the surface plies on the back side. 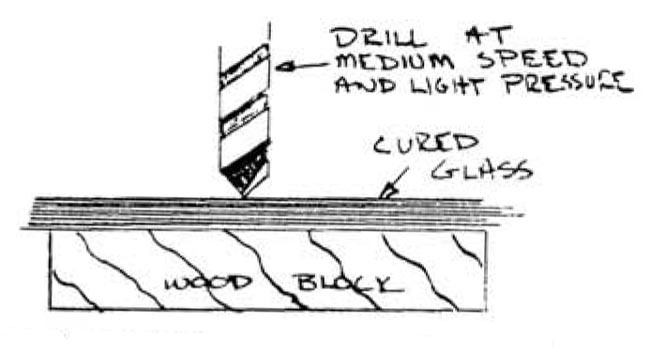 Backup a glass layup with a wood block for drilling as shown and drill at medium speed. Using a small hone, grind the cutting edges of your drill bit flat as ahown (not undercut). This will keep the drill from grabbing into the glass. Don’t overdo it, just make a couple of light passes with the hone. 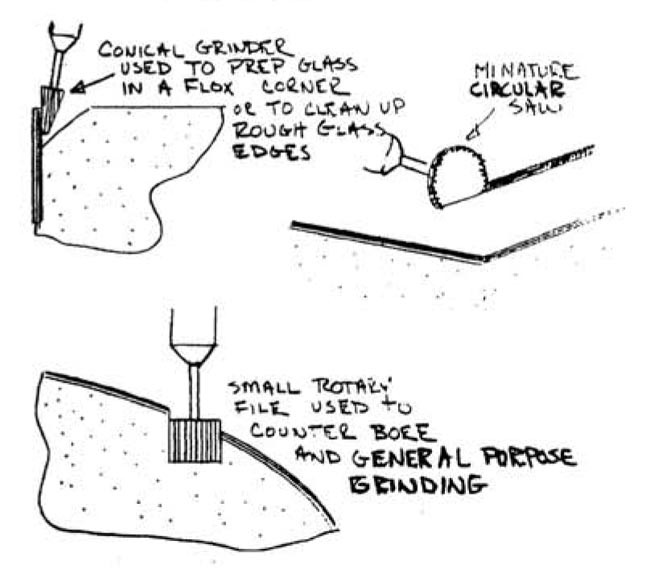 In several places rough cured glass surfaces occur where overlaps or thick buildups are done. 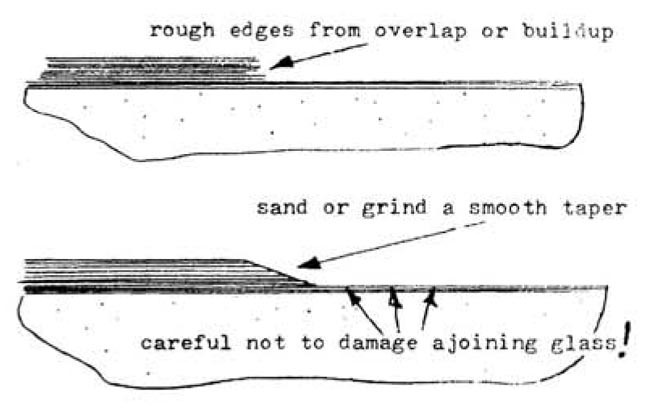 These rough edges should be smoothed as shown using a grinder or sanding block. The Dremel (Moto Tool) or Home Shop (Weller) is a very versatile tool with many uses in the construction of your Eze. The kits usually have a nice selection of bits, cutters, grinders, stones, and mandrel for every concievable use. The three types of bits shown here are the most useful for your project. Don’t throw the others out, your buddy nest door sight be able to use thea on his radio controlled golfball project. One of the most irportant things you must know is how to inspect for the presence of air within a layup. Air leaves somewhat crystal-like flecks of white areas, noticeably different than the white color of the microballoons. 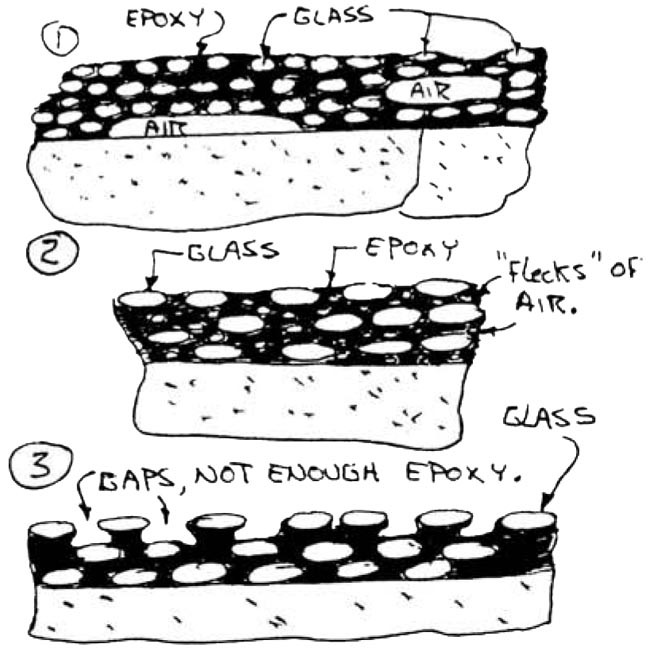 The presence of air is shown in the adjacent sketches in 3 forms: (1) A bubble or large void at the foam surface or within the laminate, (2) small, bubbles of air scattered throughout an area, or (3) inadequate filling of the outer ply. 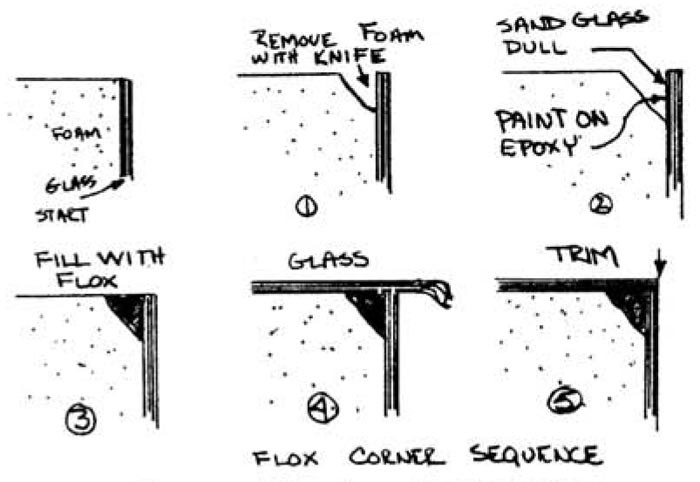 Make a layup of 3 ply BID in a 6-inch square over a scrap piece of foam, trying to achieve these 3 types of dryness. Let it cure with the defects. This will be a handy sample to use to instruct others who wili help you inspect.